or program, but we will be electing new Board members. we will play a little game to distribute the art among the participants. the school art programs. Ya’ll come!! Annual meeting and fabulous potluck. 6:30 for schmoozing and dinner at 7:00. Plan to come and bring a guest or significant other. Prospective members are very welcome. Details from Beverly McAnulty are below!! January 17, 2017 will be AAG’s annual potluck at Holy Comforter in the auditorium, on the third floor. We will start to gather at 6:30 to have time to mix and mingle. Dinner will be served around 7:00. The Guild will provide wine, tea, cups, ice, and plates, paper products, dinner ware. Members will need to bring a dish or two to share. There will not be a full business meeting or program, but we will be electing new Board members. We will also continue our tradition of sharing our talents by bringing an example of our art for those who would like to participate. Wrap your art and we will play a little game to distribute the art among the participants. We will have another exchange for those who have materials, books, or supplies they would like to share. So if you are cleaning your studio and find things you are not using, you can bring them to our exchange table. There will be a time to for those who bring something for the table to take something from the table. Any items left at the end of the evening will be donated to one of the school art programs. Ya’ll come!! “The Made in NC Awards is for all you North Carolina makers, bakers, crafters, and creators. Maybe you run a microbrewery or sell handmade soaps at your local farmers market. Perhaps you are a skilled woodworker or create incredible custom clothing. Whatever it is that you make, you are proud to produce it right here in North Carolina — and we want to help you show it off to the entire state. A product like yours should not go unrecognized. If you wish to enter, you will have eight weeks to submit your product to the Made in NC Awards. After the submission period, our esteemed panel of judges will spend three weeks carefully inspecting, tasting, and testing all of your top-notch entries. The judges will choose a winner and two honorable mentions for each category, and then readers and fans will be able to vote for the Audience Choice Award winner. 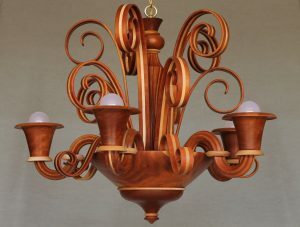 “Lights Over Venice” Chandelier of Cherry and Maple fashioned after the Venetian glass chandeliers of Murano, Venice. Husband-and-wife Jim and Rita Duxbury are the featured artists at the Mebane Arts & Community Center, 633 Corregidor St., Mebane. Their functional, 3-D art has been crafted on a wood lathe. 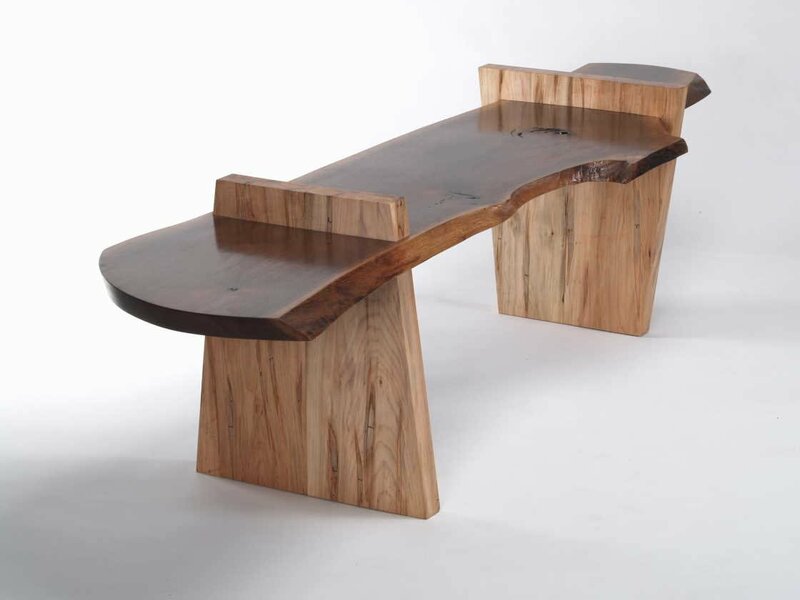 Many of the pieces are turned using local wood and others incorporate exotic wood from around the world. The pieces include a full-size, ready-to-wear wooden cowboy hat, a chandelier fashioned after the Italian glass of Venice and other unique items. Their work will be on display starting Friday through July 15 in the community center’s gallery. Rita Zoccolante Duxbury is a Massachusetts native. She is a part-time librarian at Alamance Community College. A retired U.S. Naval Intelligence officer, she has traveled the world. With an appreciation for the beauty and qualities of wood, and with the mentoring of her husband, she has gone from sweeping sawdust to creating her own pieces. Jim quit working in 1996 but has since obtained two U.S. Patents. The inventor of particulate dust respirators, his company, Duxterity LLC, markets the Resp-O-Rator™, and Elegant Creations, his gallery of fine wooden objects, includes Kaleidoscope Plans, Kaleidoscope Building DVD and custom wooden Kaleidoscopes. For more details on their exhibit, call 336-226-4495 or visit www.artsalamance.org. Guild members interested in participating in the 2016 Alamance Studio Tour can now apply. Deadline is May 15. The online application form can be accessed via this link to the Studio Tour webpage. The AAG Studio Tour Steering Committee is excited to announce that the 7th Annual Studio Tour has been set for October 8-9, 2016. Participation in the tour is open to all current members of the Alamance Artisans Guild. If you would like to join or renew, visit the Join AAG page. Members do not need to be Alamance County residents, but they do need to make arrangements to display their work in Alamance County by partnering with a local artist/participant. Applications for the Tour will become available on March 18. A link to the application will be available on the main Studio Tour page. Deadline for applications is May 15. 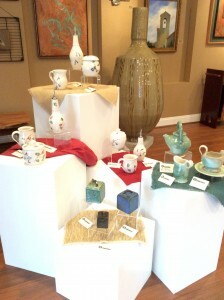 The Alamance Artisans Guild held an All-Guild Exhibit at the UNC-Chapel Hill Friday Center from May through July, 2015. This was an exciting opportunity for the many talented artists of our guild to display a wide variety of artwork in one highly visited location. The hallways and dining areas were filled with vibrant colors and diverse textures of artwork, encompassing paintings, pottery, woodwork, fiber art, glassworks, metal art, and mixed media. Several artists were recognized with awards, including the Janet Rhyne Andrews Awards for Excellence..
Thirty-eight pieces of artwork were purchased by the Friday Center totaling over $25,000. Congratulations to the twenty-two artists whose work is now part of their permanent collection. We are grateful to the Friday Center for their support of the Alamance Artisans Guild. And we are very appreciative of the efforts of Linda Gill, Chairperson of the Events Committee, and it’s members, and the many guild members who volunteered their time and talents towards making this such a successful event. The Point of View Gallery, 717 Chapel Hill Road in Burlington, NC, is hosting, for the fourth year, an invitational pottery exhibit featuring several Alamance Artisans members as well as several other noted potters from the region. The show opened March 3rd and will continue through the end of April. The opening reception will be Thursday, March 12 from 6pm to 9pm. The public is invited to come and meet some of the artists while enjoying refreshments and a glass of wine. Regional artists include Susan Filley of Chapel Hill and Joseph Sand of Randleman. 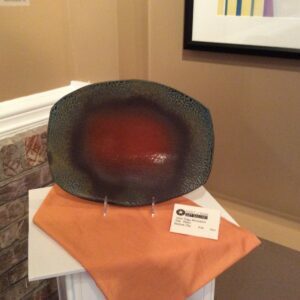 Artisan members includes potters Pam Groben, Martha Hamblin, Susan Kern and Peggy McCormick. Teapots, oil bottles, vases, lidded jars, sugar and creamers, and serving pieces are on display in all shapes, sizes and glaze combinations. In connection with their exhibit, “The Wonder of Wood,” currently at Point of View Art Gallery, furniture designer-craftsmen Keith Allen, a member of Alamance Artisans, and James Oleson will present an in-depth program about woodworking on Thursday, February 12th from 6-9 pm at Point of View Art Gallery. Free and open to the public, this is a ‘not-to-be-missed’ opportunity for anyone interested in learning how a piece of wood becomes a beautifully handcrafted piece of furniture. These two exceptional craftsmen will share their unique approaches to furniture design, explain their ‘signature techniques,’ and will also discuss the designers and craftsmen who most inspired them. “The Wonder of Wood,” exhibit, which opened January 7 at Point of View Art Gallery, will run through February 2015. The gallery, located at 717 Chapel Hill Road, Burlington, NC 27215, is open Tuesday through Friday from 10 am-5 pm, Saturday from 1-5 pm and Sunday –Monday by appointment . For directions and/or questions call 336.270.4998 or go to www.PointOfViewGallery.com or www.Facebook.com/PointOfViewArtGalleryNC . 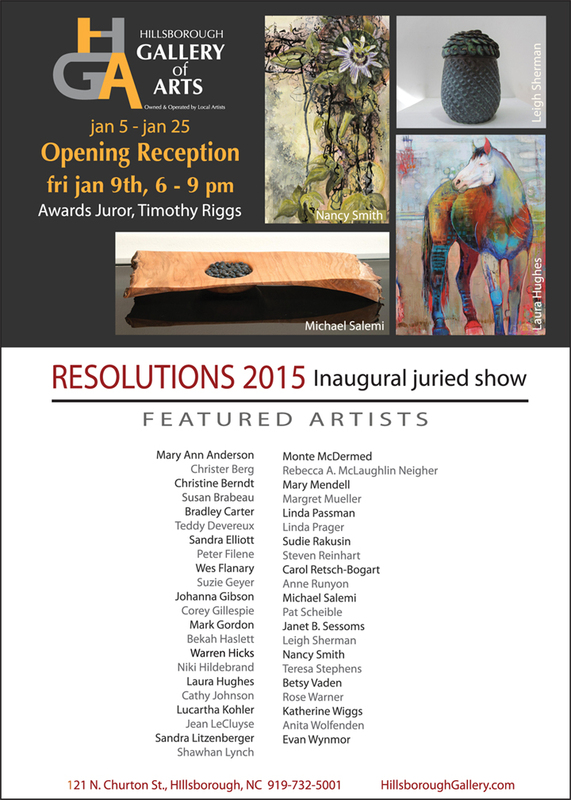 Hillsborough Gallery of Arts hosted the opening of their inaugural Juried Art Show competition, RESOLUTIONS 2015, Friday, Jan. 9th, 2015. The show will run through January 24th. Out of 100 applications, 43 artists from the North Carolina coast to the mountains were accepted. 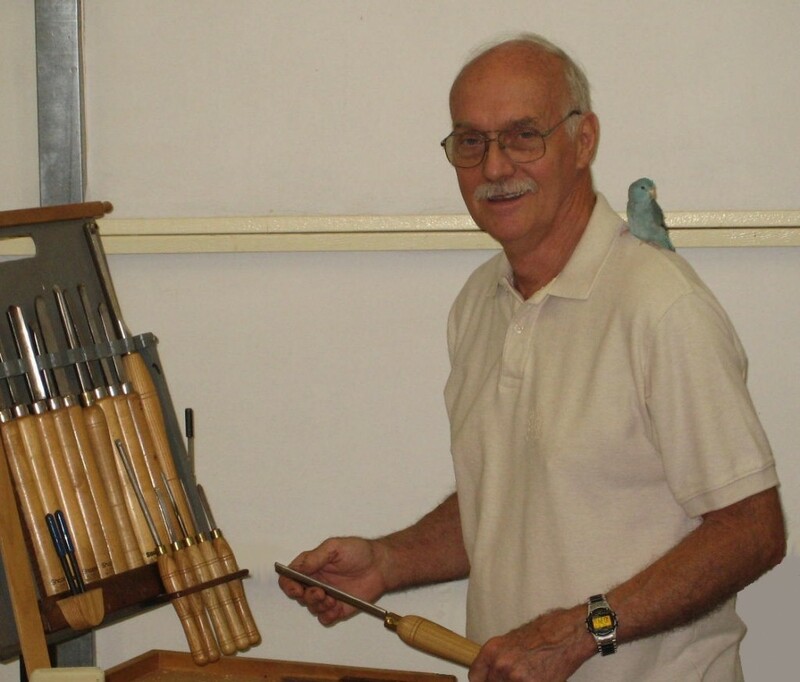 Alamance Artisans, Corey Gillespie and Pat Scheible, were two of those 43 artists. Timothy Riggs, curator from the Ackland Museum, was the awards juror and gave a talk about art and explained his reasoning behind his choices. All of the works of art are for sale. The gallery is open every day, Mon-Sat, 10-6 pm and Sunday, 12-4 pm. Duxbury and his parrolet “Bean” ready to turn.